The screen uses an IPS panel with a refresh rate of 144Hz and uses AMD FreeSync. This screen is our top pick for AMD FreeSync fans that need a high quality fast, low input lag, IPS gaming display. The MG279Q won our award for the best FreeSync monitor for gaming in our top 5 round up review. The development of innovative gaming displays has increasingly grown over the past few years. The market has been expanding due to the forever-growing popularity of video games and the constantly evolving world of technology. The gaming market has recently welcomed the arrival of high-quality and industry-grade screens. These monitors can produce higher resolutions than 4K. However, some of these monitors can get expensive really fast. 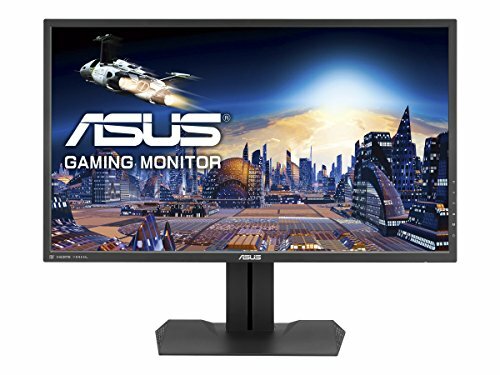 Fortunately for those of you who don’t have a ton of money to dish out, there are more affordable monitors available that still maintain the same quality. Take the ASUS MG279Q WQHD for example. It is one of the leading gaming screens on the market today and is under one thousand dollars. Do you enjoy playing video games on a crisp and clear screen? There is nothing like that real-life effect when you're playing your favorite game. The ASUS MG279Q WQHD prides itself on delivering the ultimate display with its WQHD 2560 x 1440 resolution display and IPS technology that gives wide-viewing angles and vivid visuals. You won't believe what you are getting for the small price you will pay—this gaming display is hard to beat. Now this ASUS MG279Q WQHD review can hype up the device all we want but that’s just all talk. Let's get down to the underlying facts that make this monitor worth purchasing. Due to its sleek design and slim build, the ASUS MG279Q WQHD will be easy to setup and mount if needed. It will also easily fit in any space, making every room look complete. The screen weighs approximately 16.1 pounds with a dimension of 29.7 x 8.9 x 17.8 inches. The screen is black all around, with an all black stand. The screen is sleek and thin, giving you the feel of watching your game on a movie theater screen. In addition, its long stand allows gamers to adjust it to any position desired. If you are worried about hanging it up and it falling, you won't need to worry about the ASUS MG279Q WQHD. It comes with an extremely durable wall-mount capability, and the weight of the screen isn’t heavy enough to worry about. The beauty of its build is you can easily move it from room to room with no issues. The ASUS MG279Q WQHD is straightforward when it comes to its design and technology. It will not fail to impress, especially for a gaming panel that is affordable. Gamers will highly enjoy the Adaptive Sync technology, which provides a smooth gameplay. Players will also have the privilege of getting their eyes protected without even realizing it, allowing them to play for long hours with no harm. The designers of the ASUS MG279Q WQHD clearly understand that compromised equipment can seriously harm your shot at victory. Their premium MG279Q is designed to remove the option of visually ruining your game. This screen is the full package, enhanced with the high speed of a TN panel and producing visuals that are life-like from an IPS panel. It combines the best of the TN and IPS worlds, ensuring a victory is purely the outcome of your own skill. The ASUS MG279Q WQHD comes with exclusive technologies for the buyer. As if the WQHD 2560 x 1440 resolution display wasn’t enough, players will also get the advantage of its Game Plus, Game Visual technology, Advanced Connectivity, and eye care technologies. Their specially designed Game Plus technology involves adding timers and crosshair overlay to the game, so players can ensure a raid operates smoothly. The Game Visual technology is specifically tailored to each available game genre in order to enhance the visuals and ensure players to have the best gaming experience. Their Advanced Connectivity involves the DisplayPort 1.2a, which enables FreeSync and Quad HD. In addition, it has dual HDMI and USB 3.0 ports that allow players to plug any peripherals of their choice. Lastly, the ASUS MG279Q WQHD is designed with a special ultra-low blue light that has a flicker-free technology in order to protect the eyes, so gamers can comfortably play marathons. ​Other customers have said the screen came with some dust on it from the packaging. ​Might experience a slight backlight bleed. Overall, for the price of the ASUS MG279Q WQHD, gamers are receiving a sweet deal. Most game monitors cost over a grand and deliver similar qualities. At first glance, the sleek appearance and size will impress any gamer. More importantly, it’s WQHD 2560 x 1440 resolution display will provide you a truly immersive and real-life feel. This monitor’s technology on its own will give gamers the experience they have always dreamt of. If you are a serious gamer, the ASUS MG279Q WQHD is worth the investment.